in 2010, Mary Drinkwater, who has spent several years in this region of Kenya while doing research on her PhD in Education reported "The children in this community have to walk several kilometers every day to go to school. Currently several of the younger ones are being taught by a volunteer teacher in a local church building. The community is motivated to build a small school to provide early education - up to grade III - so that the very young can be taught without a long and often dangerous (there are wild animals in the region) walk to school every day. "Once the children are above age 10 they will likely go to a local boarding school to continue their education. In September 2011 CanAssist started the first of three proposed classrooms for the Oltaraja Primary School. The community has a very active education committee which has contributed to the project as well. In November 2011, Mary was able to celebrate the completion of the first classroom with the community. The smile on her face as she rings the school bell tells the story. 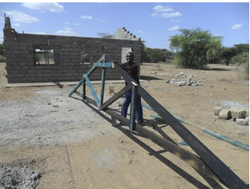 With specific donations from the Ontario Catholic Teachers' Association, the Ontario Teachers' Federation, MacKenzie Investments and Bridgehouse Asset Managers, CanAssist is funding construction of a second classroom at this remote Maasai community school in 2014. The classroom should be complete by mid September.